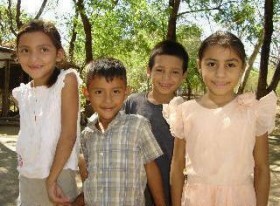 I am excited to share from my experience this summer in Nicaragua with Because We Care Ministries. I have served with BWCM in previous years and each year, God reveals His faithfulness in fulfilling His purposes for the team who serve together in this poor country. Many of you know that Nicaragua experienced a time of heightened social unrest earlier this year. I had been aware of political unrest before, but this was the first time I had seen roadblocks set up to deter the transportation of goods throughout the country. I was never afraid or reluctant to travel to Nicaragua and I am very glad to have followed through with plans to lead our team on this mission trip. There was something different about this trip, compared to previous years. We were greeted with hungry, desperate faces in every village and I can’t recall how many times I heard, “Please pray for our country” and “Thank you for coming to help our country”. 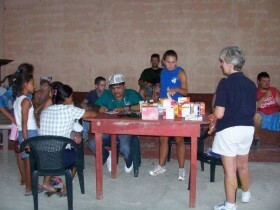 An experience that has stood out in my mind was our visit to the village of Torres. It was a long, rough ride and the trucks had to stop and put rocks in a washed-out part of the road to get across. Back in 2004, my husband had helped build the church building, where we ministered that day. Upon arriving and unloading the truck, an elderly lady stood at the gate of the fenced-in area around the church in Torres and started talking to me in Spanish, motioning for me to come over to where she was standing. I hugged her and asked a translator to assist. The lady was thanking me for coming to her village, where they were very hungry. She said they hadn’t seen very many missionaries for a while and thanked me over and over. She said they were thankful to God for something to eat, other than the little bit they had in the village. She was praising God for sending us that day. Team members interacted with the villagers as mothers and young children lined up to see the doctor. The team portrayed God’s protection with a David & Goliath skit, shared the gospel message of Jesus Christ and little voices prayed the “sinner’s prayer”. As the storm clouds rumbled close by, we hurriedly distributed what we had in the back of the truck and headed down the road, rain drops pounding the tarp covering the bed of the truck.My mind kept replaying the conversation with the lady in that village and I was reminded of the impact of simple acts of obedience in Jesus’ name. We often contemplate the question, “What if the missionaries hadn’t come that day?” I believe the village of Torres would have gone to sleep hungry that night. This is just one of the many villages that are served by Because We Care Ministries’ feeding program. 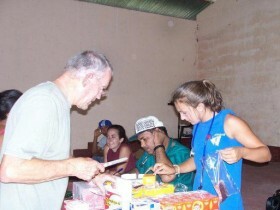 We get a small glimpse of the need for food in this country during our week-long mission trip. I am supporting Manna Fest this year, knowing that a simple act of obedience in Jesus’ name will go a long way in meeting the needs of people in a country that has suffered from this period of social unrest.